Yesterday was patch day, and with it came no few changes to Guild Wars 2 – one of the biggest being the removal of the old traits and skills system, replaced with specializations. As of yet, things aren’t perfect there – conditions are a bit too overpowered, and world bosses too weak – but it’s in, it’s here. I’ve actually done little to play around with that yet, however, as the other major part of the update has fully grabbed my attention. So, there’s a ton of things that we’d all like to see added to GW2, and we have Heart of Thorns coming Soon™. So, here’s a few things I’m hoping we’ll get! We get new faces, hairstyles, and hair colors every so often, but there’s other customization options that could stand to get some updates. 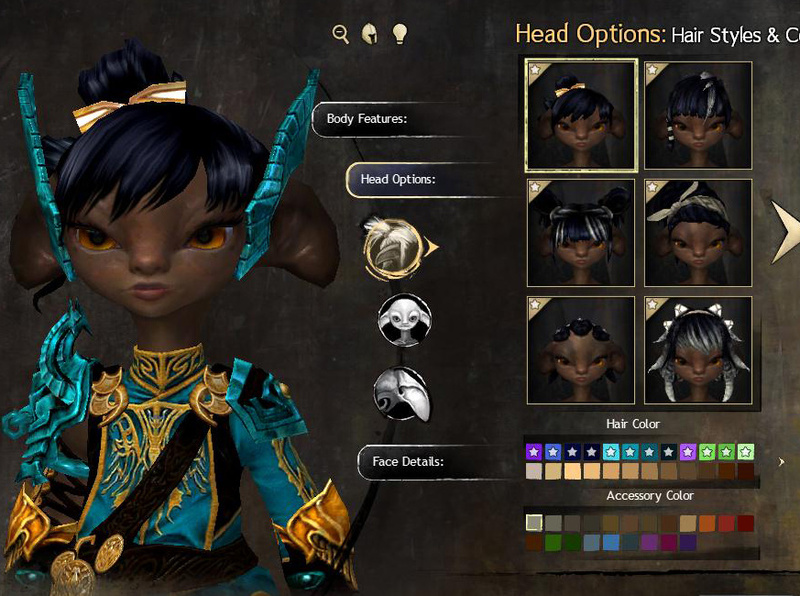 Skin tones (for all races – this includes charr fur colors). Sylvari skin patterns and glow colors. Charr fur patterns. And, to my mind the one that needs updating the most, norn tattoos and colors. There are so few tattoo options available, and the color palette is tiny. With the number of colors available in the game, I feel like this can be expanded massively. Related to that, I’d love to see scars as something that’s customizable – have it an added “body feature” channel, like glow and skin patterns and tattoos are. I don’t want it to just be available on a single norn face and that’s it – expand it to something that can be added to all faces, and bodies as well, on all races. Similarly, I’d like to see makeup being a separate channel instead of something that’s just a part of the face selection. There are quite a few faces I like but don’t care for the makeup they use. Certain hairstyles have accessories with them. You get to select the color during creation. You can’t ever change this color again unless you use a makeover or hairstyle kit. And the colors are limited to the starter palette. And adding to that, certain hairstyles have accessories where part of it has colors that cannot be changed. For example, Katta above. The gold on the bow? You cannot change that color. You can only change the center part (that I have white right now). I’d love to see accessories added as dyeable channels on the hero panel. If an accessory has more than one colored area, like in the example above, let us dye them both. And let us use the full complement of our dyes, instead of just the starter colors. 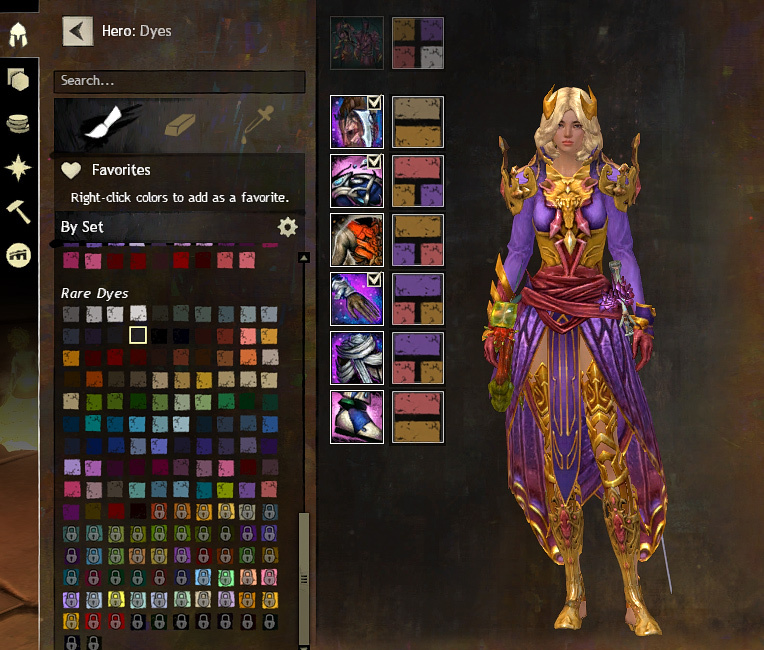 I’d love to be able to dye the bow to better match her armor (Cyanide and Redemption) but, alas, I currently cannot. Show Locked Skins in the Wardrobe Panel. Okay. If you haven’t gotten the hint yet, character looks are incredibly important to me. I fully am into Fashion Wars 2. 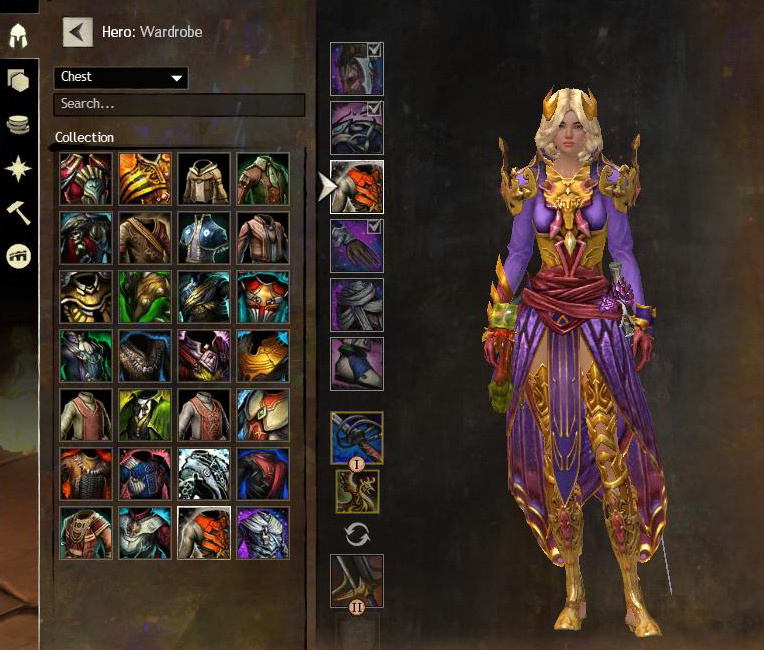 Recently, the dye panel was updated to show all colors, not just ones you’ve unlocked – locked ones were visible and previewable as well. This made previewing dye combos on armor so much easier – if you were unsure about how a dye would look, you could actually preview it in the correct channel. And if you want a dye you don’t yet have, you can look it up in the trading post from the dye panel. It was, to be quite honest, an awesome update. I’d like to see it pushed a bit further, though. I want to see skins I still have locked when I’m on this panel. I want to be able to preview them with dyes in the proper channels, so I can better build my armor combos. Different armors take dyes differently, or don’t mix together as well as you’d think. Let me make my fashion game even more fun! Okay, so this is not a cosmetic thing, finally. And since they’re in the midst of announcing Guild Hall stuff, there’s always the possibility that the answer to my wish will come later today. We’re already going to be getting cross-guild chat. So let’s just take that a step further, and make alliances a thing. A lot of guilds have already formed informal alliances (my guild is one of them), so just let us make it official and let everyone work together. We have Mawdrey. We have the Star of Gratitude. Give us something to chomp on Dragonite. Please. I’ve deleted more stacks of the stuff then I care to think about. More Uses for Karma and Obsidian Shards. Karma’s always struck me as this weird currency that they can never quite decide what to do with. It can be useful while leveling to gear out characters without spending much in the way of actual money, but once you’re leveled and geared out, it pretty much just has two uses. Buying obsidian shards, and buying gear to throw into the mystic forge and then salvage. There’s not a whole lot else to do with it. Similarly, obsidian has two uses – legendary weapon crafting, and refining ascended materials. There’s nothing else you can do with it. And if you play in the Silverwastes at all, you’ll soon find yourself with not only a large amount of karma, but a lot of obby shards. I imagine that with the introduction of precursor crafting, we’ll see more uses for karma and obby, but even so, it doesn’t hurt to ask. Okay, this is a silly one. But the only one I got before was the greatsword and I’d like to get my hands on some of the others without spending unholy amounts of gold. So, as you can see, there’s a few small things I’m interested in seeing. I’m not holding out my hopes on most of them, but I’ll be pleased to see any of these happen! Last night, during the E3 PC Gamer presentation, prepurchases for Heart of Thorns began. There were several moments of unbridled happiness. And then the internet began to burn. $50 is on the steep side for an expansion, but not out of the realm of reasonability. Most expansions these days hit around $40. It’s worth noting that the Ultimate version is the default version selected, and I find it rather shady that the others are greyed-out – generally items being greyed-out means that they are unavailable. It would have made more sense to have them look normal (black text, colored box art) but the nameplate box not colored in unless you’ve selected it. But that’s marketing for you, and I’ve always found most marketing practices on the slimy side. But here’s the first major point of contention – Heart of Thorns comes with the base game included. Okay, I’ll admit – I was minorly annoyed at that at first, for the reason of “why am I paying for something I own already”. Once I got over that, I realized that it is, to an extent, a smart move – they are phasing out the base game being available by itself, and from now on new players will get both the base game and expansion. This makes it more accessible for new players to get playing and not have to worry about if they have the right stuff or not. …but they added a section saying there’d be no physical CE. Now, the big problem in this is that a lot of people have bought the base game recently, in anticipation of the expansion releasing. They did say they are going to do refunds for people who purchased the base game recently, but even with that, it leaves kind of a sour taste. How far back is “recently” going to go? Will it just be players who bought the game in the past month or two? Is someone who bought the game in March for $40 going to be denied? I feel like a lot of this could have been avoided had they announced more info ahead of time, and if they were much clearer about it. Realistically, I don’t care that the expansion comes with the base game. I bought the CE, for $150, at launch. I’ve spent more than I care to think about on gems. I have 18 character slots in the game. I’ve gotten my money’s worth there. I feel like an expansion-only option would be a good idea, for existing players, but oh well. But this does potentially hurt a lot of newer players, and I feel like more explanation upfront could have helped immensely here. The other big thing that bothers me, and I feel is the source of much of the unhappiness, is the fact that if you’re an existing player and you buy the standard edition, you most likely need another character slot if you want to play Revenant. This means that for many existing players, you have the option of deleting an existing character, or buying a character slot – which makes the expansion realistically cost $60 or more. And yes, I get it. You can convert gold to gems for a character slot. Frankly, though, that’s pretty unreasonable, as right now 800 gems is about 150 gold. Most people are not going to take that option, as 150g in-game takes much longer to earn, unless you get exceptionally lucky, than $10 out of game. See, this just really annoys me. A new profession is being released – one that many people are eager to play. A new profession is a major part of the new expansion. And it’s one that players are going to be forced to pay more in order to play. And I also believe that this is where the whole feeling that new players are getting a better value than existing players is coming from. They are getting the base game, with five character slots, and the expansion as well. We are getting the expansion, without so much as even an extra character slot to make our new characters with. Hence, for existing players, the perceived value is much lower, and that’s where a lot of the anger is coming from. Let’s also look at it this way – the base game has gone on sale for $10 three times this year so far. As that’s the lowest it has been, it has a value of $10. A character slot costs 800 gems – which also happens to be $10. If they had simply made it so that new accounts get the base game, and existing accounts get another character slot, then much of this would have been avoided. Sure, people would still grumble about how they paid $60/$40/whatever for the base game that new players are now getting for free, and people still would have griped about $50 being high for an expansion. But for the most part, most people would be fine with it. As far as the price itself goes? Yes, $50 is high for an expansion. Most expansions now are in the $30-40 range (people point out WoW’s latest expansion being $50 is rather dishonest because all other WoW expansions were $40). 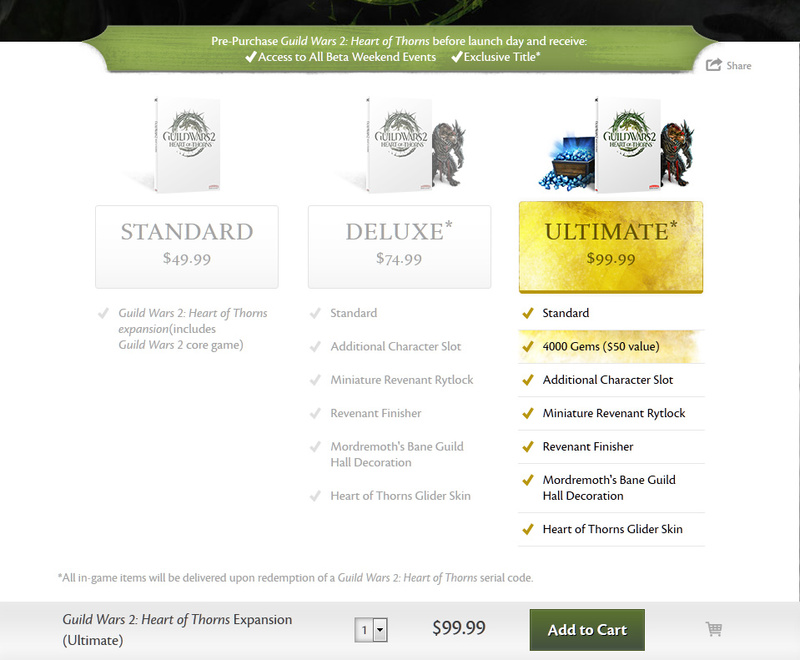 But considering the amount of play I’ve gotten out of GW2, I feel that $50 would be worth it. It’s the fact that, for many players, that $50 becomes $60 just to play all of the new content, that doesn’t sit well with me. I feel like this all has been a bit of a fumble. Let’s hope that they listen to the feedback – the reasonable feedback, anyway.